The research results submitted should not be older than 5 years and can be performed either by one scientist individually or a team of up to 5 persons, who were working at a Leibniz Institute at the time the research was done. Both self applications and suggestions of potential candidates are possible. Please submit a one-page rationale (Arial 11 pt) in English along with a pdf-document of the respective achievement (patent, publication, etc.). All applicants agree to a publication of their names, photographs and application information. The laureate(s) provide(s) information (e.g. pictures, graphics, text material, etc.) and grants copyright free of charge to the Leibniz Association and the Research Alliance for promotion purposes. The prize winner(s) will receive a medal, a certificate and 2.000 Euro prize money. The laureate(s) will be invited to the next alliance‘s conference “Wirkstofftage” to present their work. 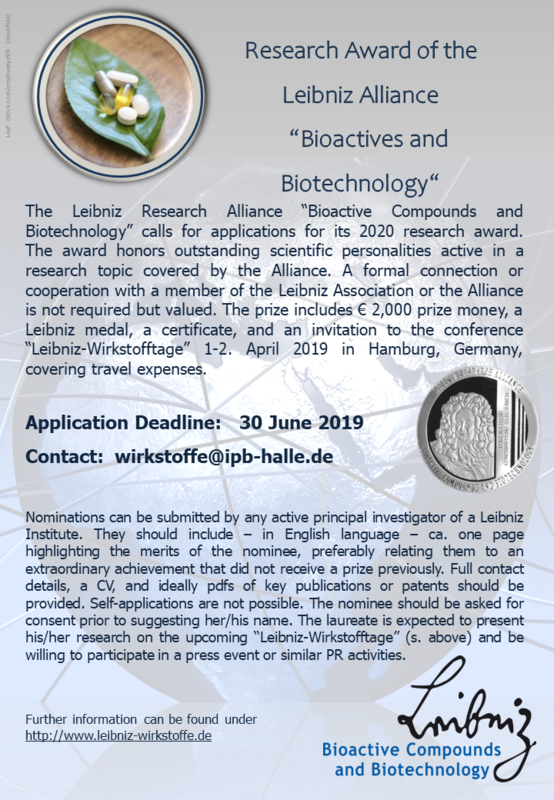 To honor the important field of new biotechnological processes, the Alliance will award the Prize “Leibniz Biotechnology Process 2019”. 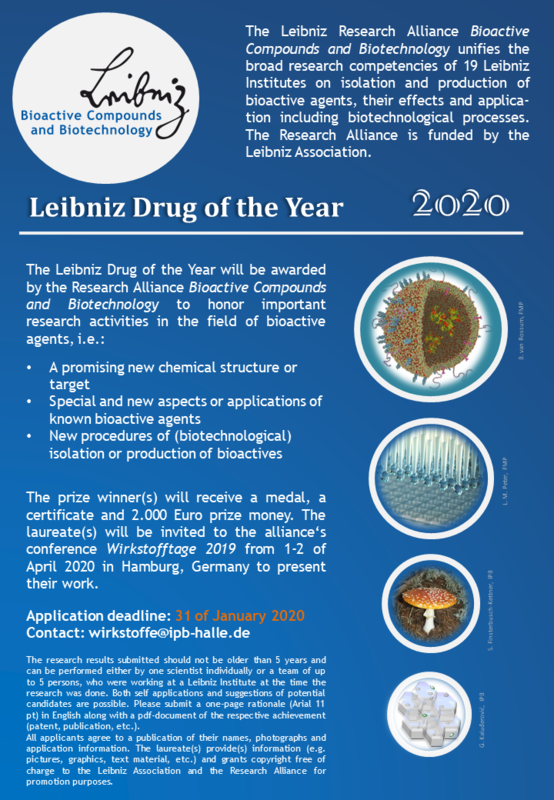 As in the case of the prize “Leibniz Drug of the Year”, the research results submitted should not be older than 5 years and can be performed either by one scientist individually or a team of up to 5 persons, who were working at a Leibniz Institute at the time the research was done. Both self applications and suggestions of potential candidates are possible. Please submit a one-page rationale (Arial 11 pt) in English along with a pdf-document of the respective achievement (patent, publication, etc.). All applicants agree to a publication of their names, photographs and application information. The laureate(s) provide(s) information (e.g. pictures, graphics, text material, etc.) and grants copyright free of charge to the Leibniz Association and the Research Alliance for promotion purposes. The prize winner(s) will receive a medal, a certificate and 2.000 Euro prize money. The laureate(s) will be invited to the next alliance‘s conference “Wirkstofftage” to present their work. The Research Award of the Leibniz Alliance “Bioactives and Biotechnology“ award honors outstanding scientific personalities active in a research topic covered by the Alliance. A formal connection or cooperation with a member of the Leibniz Association or the Alliance is not required but valued. The prize includes € 2,000 prize money, a Leibniz medal, a certificate, and an invitation to the next conference “Wirkstofftage“ covering travel expenses.